Pete Dye 1993 18 72 6837 50 minutes from downtown. 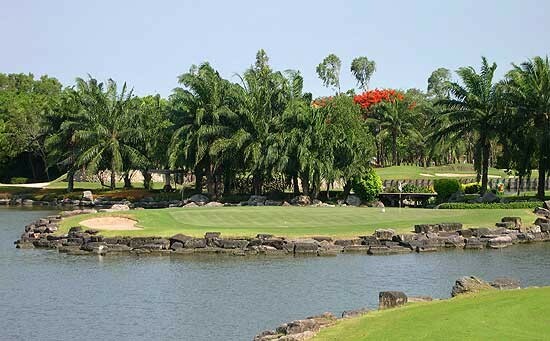 Designed by the renowned golf course designer Pete Dye and opened in 1992, Subhapruek features palm tree lined fairways and water at nearly all holes and the course boasts some challenging and tricky par-threes. This challenging 18-hole course is not one for long hitters or hookers, with beautiful white bunkers, intricately designed greens you will always find this well maintained golf course in excellent condition A pleasant breeze is often present and from tee-off the course unfolds magnificently before you giving you exactly what you see. To crown it all Subhapruek has an enormous clubhouse with almost every conceivable facility including an excellent international restaurant. A round of golf at this truly magnificent course will be a truly memorable experience.